Potatoes, cooked by whatever method, is my favourite food that can replace the rice in my meals. Yes, you all know that I’m a big fan of rice. For these twice baked potatoes, I’m totally willing to give up this title. To make this dish, it takes a few more steps to scoop out the potato flesh and make the fillings. Yet, it’s worth the effort and time. This recipe is quite forgiving. The amount of sour cream or milk is totally up to you depending on how soft and creamy the fillings you like. I didn’t season the fillings with any salt at all as I found the saltiness of bacon was just enough and turned the mashed potato fillings into something I felt hooked up to. Preheat oven to 200C / 390F. Rub potatoes under running water to remove the dirt. 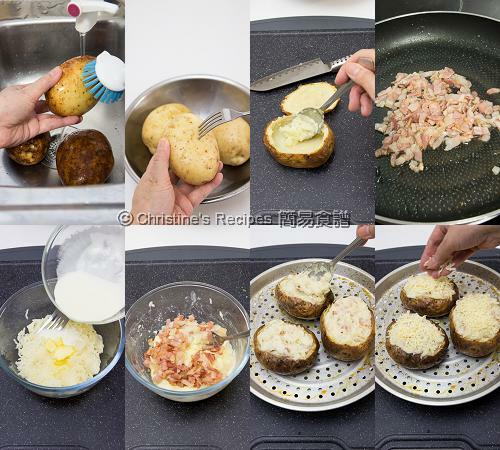 Use a fork to poke the potatoes a few times in order to prevent from exploding while baking. Rub the surface of potatoes with oil and salt. Bake for about 1½ hours, or until they are cooked through and turn soft when touched. Meanwhile, heat oil in a frying pan oven medium heat and cook the bacon until crisp. Transfer onto kitchen towel to absorb the excess oil. Set aside. When the potatoes are cooked through, remove them from the oven to let cool down a bit. Slice the top third lengthwise off the potato. Spoon out the insides into a mixing bowl, leaving about ¼-inch rim around. Mash the potato flesh in the mixing bowl. Mix in the sour cream, milk and butter. Season with pepper. Stir in the bacon. 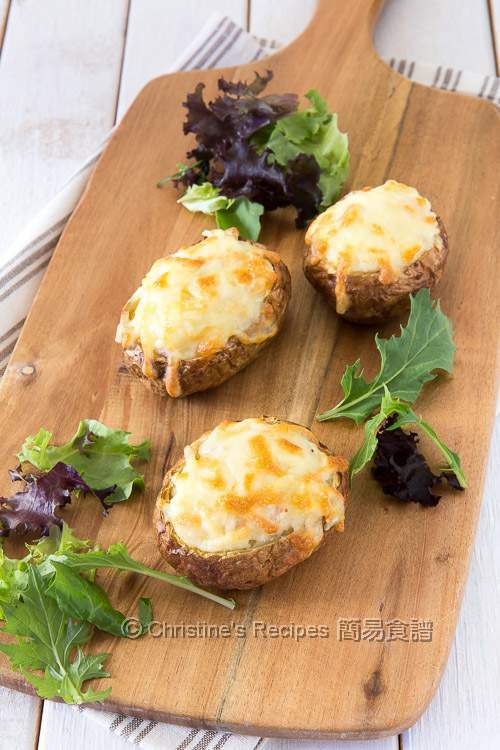 Spoon the fillings into the potato shells, topped with shredded cheese. 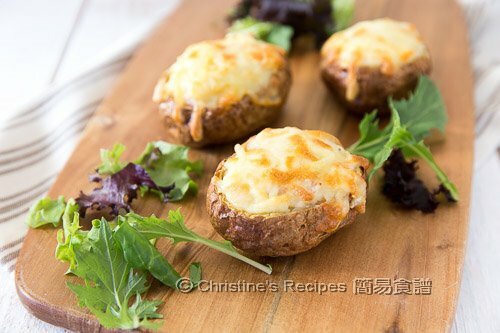 Return to the oven and bake for about 15 minutes, until the potatoes are warm through and cheese is melted. Remember to poke the potatoes before baking. One of my friends had messed up her oven with the potato flesh splashed all over on the oven walls as she forgot this step. The oven cleaning job became a nightmare. To speed up the baking process: You may cook the potatoes in a microwave oven instead after poking them. Cook on high for about 10 minutes. Now you want the potato skin turns crispy. 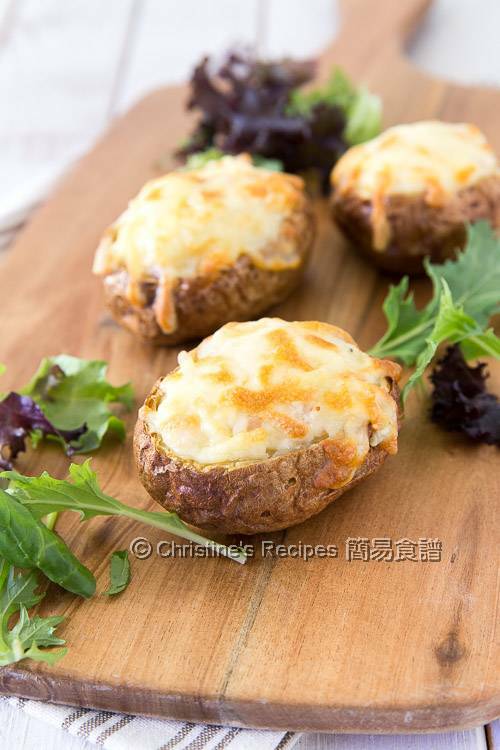 Rub oil and salt on the surface of the cooked potatoes and bake in a preheated oven at 200C / 390F for 10 minutes. If you have a convection oven, that’s good. The potato baking time can be shortened for about 20 minutes at the same temperature. They look super duper delicious! Oh! Wow! Very delicious and beautiful, I must add. Great pics!